Soft, chewy, gooey and chocolatey – that’s what these cookies are. Best part is they are a sinful tasting treat without the sin (maybe just a little bit). Of course there is no oil or butter in these little gems, but I also tried to keep the flour, sugar and fat low. You’ll notice the recipe calls for 2 med-large bananas. As such there is a very small banana taste…very slight though. If you aren’t a banana fan (I simply cannot imagine! ), try using only one banana and replacing the other with 1/2 cup applesauce. I haven’t tried this so I can’t say exactly what the end result would be, but it’s worth a try. 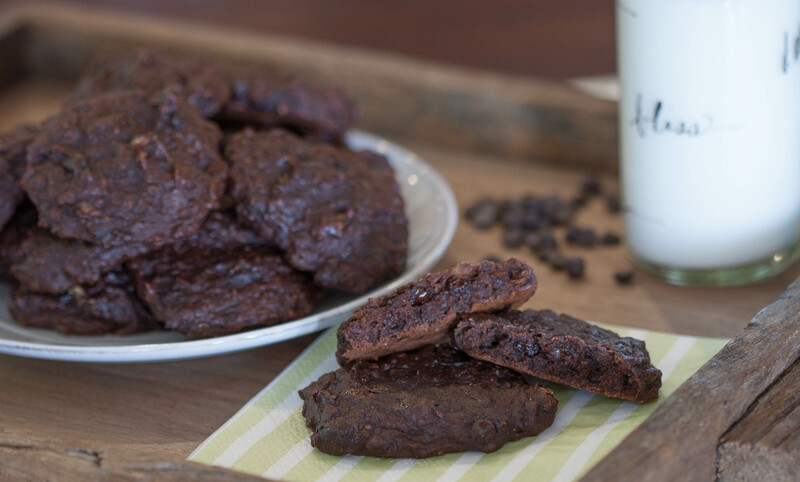 Free of eggs, dairy, oil or butter, these gluten-free chocolate cookies are easy to make, and super yummy. In medium bowl mix together flours, cocoa powder, baking powder, cinnamon, nutmeg, salt, chia seeds and chocolate chips. On a plate, shallow bowl or plastic cutting board mash banana very well with a fork, until no clumps remain and it’s pretty runny. Add nut butter and vanilla and stir. Transfer banana mixture to flour mixture and stir until well combined. Place by heaping tablespoon on cookie sheet and bake 8 minutes. Immediately transfer to cooling rack. This entry was posted in Recipes and tagged chocolate, chocolate chip, cookies, eggless, gluten-free, non-dairy, oil-free, vegan by Shelly Detken. Bookmark the permalink.